7 Great Values to Live By - Something New Everyday! 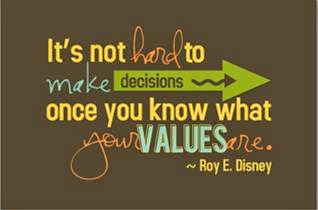 It is said that decision making becomes easy if you know your Values. Or indirectly saying, your Values make it easy for you to make decisions. Not only this, your Values strengthen your character, portrays the persistency in your personality, systemize your life and remind you to focus on the things which matter the most in a way which is defined by the Values you chose to live by. So, after all, what are Values? The Values are the characteristics and the principles which you adopt in your routine life to live by. For example if a person lives with the Values of "Being Adaptable" and "Being Optimistic" then he/she would be more elastic to different situations (Adaptable) and would be less stressful in tragic situations (Optimistic). Hence, it would be appropriate to say that your Values are shaping your present and your future. There is a big difference between Human Being and Being Human. Latter requires you helping others by all possible means which demands high level of empathy from you. Empathy is the skill to understand the emotions as well as needs of people and to treat them according to their emotional reaction. This skill is closely linked with the emotional intelligence which is basically analyzing, assessing and managing the emotion of oneself and others. So by developing and practicing this Value not only you resolve someone's conflicts and problems but also win their hearts ! Once you decide something, you have to make sure you complete it by all positive and logical and fair means. Once you start living with this Value, you will make things happen by strictly sticking to your goals. An indicative to strong commitment is that you start focusing on the solutions to the problems instead of finding the excuses. You would know that a weak approach to any task means you are already half lost it. So living this Value empower your "Can-do-Attitude"
3- Being Optimistic: Positive people are part of solutions instead of complaining, criticizing, cursing, contradicting, confronting, conspiring and corrupting. Being positive gives you great flexibility and a sense of independence because you chose to ignore the negative thoughts and free up your mind to focus on things which can add value to your life. Eventually you enhance your productivity by adopting this Value. The stanza says, "When Your Head is on the Pillow, and the day is almost done; Count God's blessings, Count Them One by One. If you are reading this article, you are better than billions of people who do not have even basic necessities such as food to eat, bed to sleep, clothes to wear and even clean water to drink. Generally speaking, it is believed that people who have high level of gratitude posses deep peace of mind and are high achievers in life. You can practice this Value by dedicating 5 minutes at the end of each day and being thankful to God by refreshing the blessings you have including each organ of your body and several other materialistic/financial blessings. To strengthen this Value, compare yourself with the people who don't have these blessings. Stubborn people suffer from many problems such as stress, wrong decisions, professional stagnancy, family imbalance and emotional disturbance. You have to understand that you cannot boil the ocean nor you can spin the world. So be flexible to the changing situations and adopt yourself accordingly. Be fair, logical and analytical in judging the situations and change your strategy to control or mitigate the side effects. However this does not mean to allow yourself to 'go-with-the-wind"; instead, be concrete on your goal achievement however be elastic in your approach to reach to the destination. Being Analytical means analyzing any situation from logical, personal, religious, emotional, financial, needs Vs wants, familial and professional perspectives. Being analytical gives you the wisdom to see things from wider angle and consider things from all stake holders' perspective so that your decisions are healthy and fruitful in the long run and are in the best interest of yourself, your family and your business. Trust is the permanent certainty and confident expectation from someone for something. Lack of trust might lead to shattered relations so Trust is the most critical ingredient for strong relationship; the relation which can either be between Husband-Wife, Boss-Employee, Father-Son, Brother-Sister, supplier-customer and so on. You can adopt and demonstrate this Value by being truthful to others, by meeting our promises, keeping the secrets and providing fair advises, honest with our loved ones. So what are your favorite Values?